The official editor for Fallout 3 is hitting PCs for free next month and both the PC and 360 are getting DLC come January, with more due in February and March, Bethesda Softworks announced today. 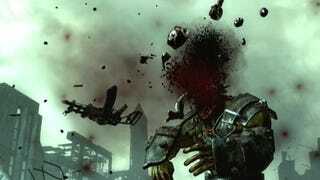 "We've always seen the original world of Fallout 3 as a foundation for even more content. Some created by us, and a lot more created by users," said Todd Howard, game director for Fallout 3. "It's fun to create your own character, but it can be equally fun to create your own adventures. We can't wait to see what the community does with the G.E.C.K." The Garden of Eden Creation Kit will let users create, modify, and edit any data for use with Fallout 3, from building landscapes, towns, and locations to writing dialogue, creating characters, weapons and creatures. The three downloadable content packs coming to the 360 and Games for Windows Live starting in January will add new quests, items and content:• Operation: Anchorage. Enter a military simulation and fight in one of the greatest battles of the Fallout universe – the liberation of Anchorage, Alaska from its Chinese Communist invaders. An action-packed battle scheduled for release in January. • The Pitt. Journey to the industrial raider town called The Pitt, located in the remains of Pittsburgh. Choose your side. Scheduled for release in February. • Broken Steel. Join the ranks of the Brotherhood of Steel and rid the Capital Wasteland of the Enclave remnants once and for all. Continues the adventure past the main quest. Scheduled for release in March.